This “Nkishi” portrays a visual power that Songye sculptures are known for, as well as a sense of purposeful intention for which it may have been carved. 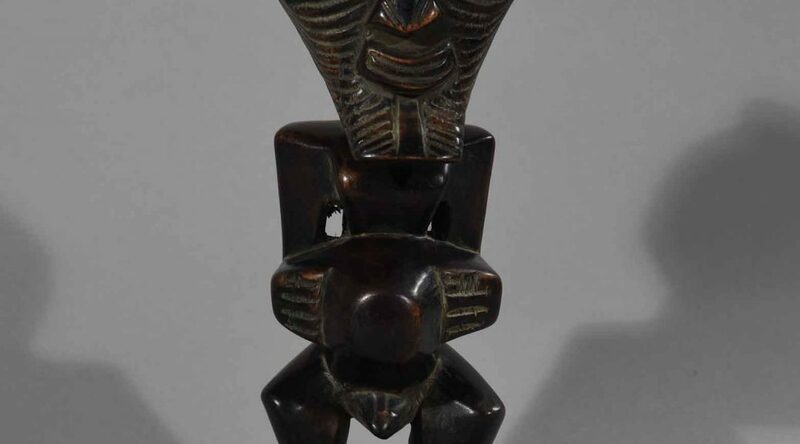 For the Songye, figures such as this were carved for an individual, or a family, as an instrument of communication, healing and/or protection against malevolent forces. 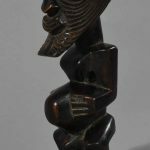 The size and style of carving of this figure indicate that it was probably a private and intimate object used by a client, kept in the home, and believed to interact with the spirits or forces on behalf of the client for a specific problem or situation. The client would have approached a nganga, a magical specialist, who would have prescribed the details of the carving. But the figure would not be meaningful until an empowered mixture of ingredients or “bishimba“, such as animal, vegetal or mineral substances, would be inserted. Regarding this figure it would have been either in the abdominal cavity or the top of the head. Usually, a complete ritual procedure would be completed, and through these specific steps the figure would be activated with its protective force. 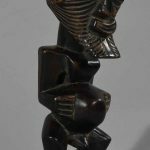 This particular figure is a truncated form, with thick integral round base supporting a full rounded abdomen, the emphasis of the abdomen expresses fertility and communicates to the Songye the ongoing cycle of life and the link to their ancestors. 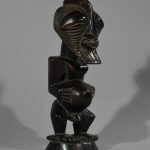 While this figure may have once been covered with more attachments and accessories, it still retains a powerful presence due to the boldness of its carving. Age: 2nd half 20th Century. Measure: H: 31, W: 11, D: 9 cm. 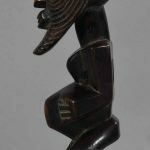 Condition: Despite age and diligent use, this figure is in an exceptionally good condition. Deep dark brown shiny patina standing on a round base. No insect bites, swaths or cracks in the tree.